This John Degan, his wife, Sarah, and their son, Alex, were formerly linked to Sarah A. (wife of Francis Compton)...as another spouse of Sarah A. This was an assumption. Thus this linking has been removed, and this family is intentionally left orphaned from the main tree...and is kept only for reference in case a connection that makes sense is found. It was a futile attempt to account for where Ora Ella Scaggs was during the 1880 census, when her siblings are with their grandmother, Sarah A. (Compton). Ella was about 14 at that time, and her whereabouts for that period are unknown. There is no solid evidence to show that the Ellen Scags in the Degan family shown here is our Ella. The only data here suggesting that it is her, is the location in Coffee Precinct and her age. However, she is listed as John's granddaughter, which would not seem possible for our Ella. [S18901] 1870 US Census, Rochester Mills, Coffee Precinct, Wabash Co, IL. 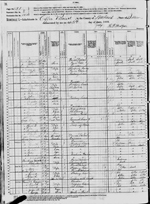 [S18883] 1860 US Census, Wabash Co, IL. Birth year estimated from 34-year age in 1850 census.